Photo shows a view of the new Broad Museum in downtown Los Angeles, Sept. 15, 2015. When he arrived in Los Angeles more than 50 years ago, Eli Broad once said, he found himself in a city without a cultural center. So the billionaire arts patron decided to build one. On Sept. 20 that effort takes a major step forward with the opening of The Broad, a shining, pop-art styled museum holding 2,000 works by arguably every important contemporary artist of the past 60 years. The $140 million project featuring 50,000 square feet of exhibition space is the most recent accomplishment in Broad's ongoing effort to remake a once seedy section of downtown Los Angeles into the cultural arts center he has long envisioned. But more than that, says Joanne Heyler, a veteran curator and the new museum's director, The Broad stands to remake Los Angeles into the nation's contemporary art capital. "Los Angeles is now a place, a city, where if you're serious about collecting contemporary art, if you're serious about understanding contemporary art, you cannot not come here,'' she said as she led a recent tour through the museum. The three-story building itself is almost as much a pop-art creation as the numerous works by Andy Warhol, Cindy Sherman, Chris Burden and scores of others that it contains. Its unusual appearance, created by Diller Scofidio Renfro, the architectural firm that envisioned New York City's High Line park, features a white, honeycombed "veil' made of fiberglass-reinforced concrete. It's a wrapping that envelops the building from its roof to the ground, providing an enclosed public sidewalk from which passers-by can gaze in at some of the works. The museum itself sits directly across the street from LA's Museum of Contemporary Art, of which Broad was the founding director when it opened in 1979. It is next door to the Walt Disney Concert Hall, which opened in 2003 after a $250 million fundraising effort spearheaded by Broad, who made a fortune in real estate and investments before turning his attention to the arts and philanthropy. 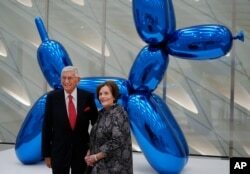 Eli Broad and his wife Edythe pose for a photo in front of a Jeff Koons sculpture at Broad's new museum called "The Broad" in downtown Los Angeles, Sept. 16, 2015. Like the sometimes controversial contemporary works inside, reaction to the new building has been mixed. Los Angeles Times architecture critic Christopher Hawthorne recently gave it a lukewarm review, calling its facade "surprisingly punchless,'' especially when compared to that of its more flamboyant neighbor, the shimmering silver Disney Hall designed by Frank Gehry. Whatever people come to think, of it, Heyler said, it will be a museum that resembles no other. For one thing, there will be no admission desk in the lobby because there will be no admission fee. Instead, the lobby will resemble an Apple store, with museum "associates'' armed with smartphones wandering the floor, checking visitors in and directing them to the nearly two dozen galleries. Although admission is free, reservations are recommended so visitors can get in at the times they prefer. Some 40,000 people made reservations during the first two days they were offered earlier this month, causing the museum's computers to crash. With works arranged chronologically, first-time visitors are advised to take an escalator to the third floor, where among the first things they'll see is Jeff Koons' brilliantly colorful "Tulips'' sculpture. Around the corner will be many of the most influential pop-art works of the 1960s, including Warhol's famous "Small Torn Campbell's Soup Can (Pepper Pot)" and other prominent pieces by Jasper Johns and Robert Rauschenberg. From there it's a trip through the pop, abstract and contemporary art worlds of the 1960s, '70s, '80s and '90s, with paintings, sculptures, photographs and other works by the likes of Ed Ruscha, Roy Lichtenstein, Charles Ray and others. Among the many highlights are Ruscha's heralded "Norms La Cienega On Fire'' painting and Koons' stunning porcelain sculpture of Michael Jackson and his pet chimp Bubbles. On the first floor are more recent works, including Takashi Murakami's colorful yet sobering 82-foot mural "In the Land of the Dead, Stepping on the Tail of a Rainbow.'' The painting, inspired by Japan's deadly 2011 earthquake and tsunami, covers most of two walls. Nearby, in a darkened gallery, is Ragnar Kjartansson's whimsical performance-art piece "The Visitors.'' Displayed on nine video screens, it features musicians playing and singing a brief musical snippet inspired by the group Abba over and over for more than an hour. Among the performers is the Icelandic artist himself, who sits naked in a bathtub, strumming his guitar. The second floor holds the museum's vault and, thanks to a large porthole, visitors will actually be able to look into it and see works not currently on display. It's a vault being constantly added to, said Heyler, who noted that the museum acquires an average of one new work a week. Asked who makes the final decision on those pricey acquisitions, she laughed. "He tends to have the last word,'' she said of Broad, the 82-year-old arts patron who has been collecting for more than 50 years and who is said to have paid $11.7 million for that Warhol soup can painting on the third floor.